This is Olivia, a digital-first customer. She uses her mobile phone, tablet, and laptop to research, shop, purchase, review, and consume products and services. After a long day working at her catering business, she picks up her tablet to start planning for her upcoming vacation. She needs some new climbing gear and finds just what she needs on the ZYX Mountaineering website. Bingo! Unfortunately, when she attempts to place an order for the new equipment, something goes wrong on the ZYX website. The shopping cart page runs very slowly when she tries to buy her new backpack, and Olivia can’t figure out why she can’t complete the transaction. Frustrated by how the long the process is taking, she gives up on ZYX and orders the gear from a competitor instead. She wonders whether she will do business with ZYX again. Now, imagine that you work for ZYX Mountaineering. Let’s take a look at what’s happening behind the scenes while Olivia is enduring that poor digital customer experience. First, your company may not even be aware that anyone is having problems and Olivia’s frustrations could go completely unnoticed. By the time someone has contacted customer service or posted an unhappy message on social media about the issue, who knows how many customers like Olivia have left your website in frustration? That’s because the development and operations teams may not know, for example, that one crucial microservice of the dozens of services that power your website is bottlenecking the purchase process, due to a bad database call that’s taking five times as long as it should. The product team doesn’t have visibility into these issues for the new features that they’re rolling out, or whether customers are even using those features. Worse, ZYX executives have no idea that they’re even losing Olivia and other customers to the competition, much less why it’s happening. Clearly there’s a problem. Everyone is flying blind when it comes to understanding exactly what kind of experiences their customers are having. As an avid climber with a high discretionary income, Olivia’s potential customer lifetime value is significant, and ZYX may have just lost that business forever. Of course, it’s not just about Olivia, it’s about all the other Olivias out there and making sure your company comes through in the digital moment of truth. Your digital channels are transforming the way you’re engaging with your customers, creating new brand relationships, services and even businesses. It’s no longer enough to keep the lights running for websites and mobile apps—they need be instant, robust, and reliable. Digital-native consumers like Olivia expect nothing less. To keep them satisfied, companies must set the bar higher on their digital experiences, in order to remain competitive in this new battleground. This ebook is designed to help you do just that. We’ll introduce you to the team sport of creating great digital customer experiences, talk about the data that teams throughout the organization need to access, lay out a pragmatic methodology for understanding and optimizing the digital customer experiences you create, and identify digital intelligence tools that can help you achieve your digital customer experience goals. Chapter 1: How Much Do You Know About Your Digital Customer Experience? Digital experiences are increasingly how companies engage with their customers. And we’re not talking just about digital-native brands, but all kinds of companies, from banks to retailers, donut shops to automotive manufacturers. Even traditional business-to-business industries such as suppliers of construction materials are transforming the buyer’s journey into a digital path. They have no choice. Legions of digital-first customers like Olivia give their loyalty—and their money—to the companies that offer the best, most reliable, most convenient digital experiences. You and your team can’t afford to let these customers down, even at the business times. Let’s put you on the spot. Can you answer these five critical questions about how well your company’s software is working and what kind of customer experience it provides? 1. Do you know if the check-out transactions in your website or mobile app are working, 24/7/365? 2. Are there slowdowns in your website or crashes in your mobile app causing frustrated users to leave during peak traffic situations? 3. Are your customers using the new feature that you just launched—and is it working properly? 4. How often do your top customers interact with your website or mobile app—and are you keeping them happy? 5. Can you report back to the business about customer engagement with your website or mobile app—and the impact of that engagement on business outcomes? In a study conducted for Accenture Interactive,1 Forrester Consulting found that improving the customer experience topped the list of respondents’ business priorities. Of those surveyed, 63% plan to enhance the online experience and 46% are looking to add or improve mobile offerings. 1Improving Customer Experience Is Top Business Priority for Companies Pursuing Digital Transformation, According to Accenture Study, Accenture, October 27, 2015. To deliver a first-class digital customer experience—one that meets the needs and expectations of today’s consumers, partners, and business customers at all times—it takes more than brilliant software developers. It requires attention and expertise from multiple disciplines across the entire company—marketing, sales, application owners, product managers, developers, operations, designers, customer care, and executives. It’s this cross-functional team that determines the strategy, defines features and goals, creates the experience, brings it to market, and keeps it humming along to delight customers like Olivia. This is where the proverbial buck stops when it comes to your brand’s digital customer experience. When your websites and your apps are your business, it’s not surprising that it takes the input of the entire business to make it successful. In organizations that deliver a superior digital customer experience, the engine driving this team is data. Data about errors. Data about performance. Data about outages. Data about users. Data about engagement. Data about revenue. Data about your digital business. successful business outcomes. The right data gives the team visibility and insight to guide their decisions and ultimately prove the impact of their efforts on the company’s goals. Where do best-of-breed digital customer experience companies get this rich supply of real-time and historical data? From the New Relic platform, of course. 216 Ways Application Performance Impacts the Business,” APMdigest, November 16, 2015. It’s 8 p.m.—Do You Know What Your Customers Are Doing? Fortunately for ZYX Mountaineering, Olivia is willing to give your brand one more chance. Your new mobile app has created excitement about special offers available for frequent customers. This has piqued Olivia’s interest and she decides to download your app. It’s 8 p.m. and she fires up the mobile app. What happens next is important, but the mobile app is only the beginning. Olivia expects a seamless digital experience across any device she might use at any time. 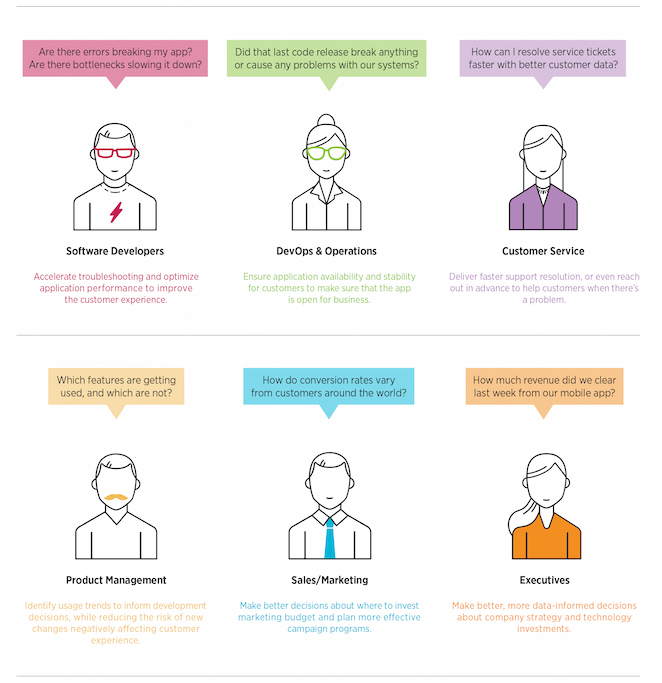 What kind of omnichannel experience are you providing? she’s using on her tablet? Will she experience a delay caused by latency based on her location far from the cloud service provider where your web app resides? Will a high-traffic promotion lead to performance delays? Just as important, will you be able to see the performance and the experience she’s getting from end to end—that is, all the way from your mobile app to the backend and third-party services? It’s not only the software team that needs to understand Olivia’s digital customer experience. Other parts of the organization need this insight as well. Success requires making sure that everyone who needs the data can get it—in the format they need, whenever they need it—and is empowered to use that data to improve the organization’s digital customer experience. Creating and nurturing a great digital customer experience is not as easy as simply deploying the right digital intelligence solution. You also have to create processes to support widespread data sharing. • Is your store open and serving the expected number of users? • Are users abandoning transactions mid-stream? • Are your customers able to check out smoothly and without glitches? • Which features are getting the most engagement? • Are conversion rates holding steady, rising, or falling? • Are users in some geographic regions using your services differently than in others? These and similar metrics help establish the current state of your digital business, customer experience, and application performance. To make sure your data-collection efforts deliver their full potential, you’ll want a digital intelligence solution that delivers end-to-end visibility across the full stack, easy-to-use dashboards, and real-time as well as historical data. Your solution should also enable you to create a monitoring and alert strategy that automatically notifies relevant stakeholders when specified customer experience thresholds are reached. It’s critical to know when customers like Olivia are experiencing issues without having to wait until droves of unhappy users start abandoning your site. data to improve the digital customer experience. Tracking application performance, usage, and customer experience lets you see what’s happening with your software and its impact on users and your business. Typically, you’ll also start identifying issues you need to fix. A particular page may be loading too slowly. A certain step in the transaction process might be throwing errors. A mobile issue could be impacting conversions. To help you troubleshoot more efficiently, your digital intelligence solution should provide code-level visibility for faster, easier identification of the root cause of the problem. • Features and products that aren’t working as planned or attracting as many users as expected. Critically, that focus should extend across all your digital channels, from desktop websites to mobile websites and native mobile apps all the way to set-top boxes. This additional layer of visibility helps identify performance and customer experience issues, and make the connection between performance issues and their effect on the customer experience. The idea is to know that the 50% slowdown the app experienced led to a 20% increase in users leaving the website and abandoning their shopping carts, for example. Once you’ve dealt with troubleshooting the issues that you surfaced in Step 2, you’re ready to be proactive. This is where your team focuses on iterative, proactive, and continuous optimization of your software’s performance and the experience it delivers. Organizations that have adopted a DevOps approach will find this process very familiar. Integrating development and operations functions helps both teams work more closely together, sharing responsibility to speed development and continuously improve both performance and customer experience. These short, rapid feedback and deployment cycles are well suited for the kind of consistent iteration that leads to great customer experiences. The in-depth, end-to-end visibility gained in Step 1 is essential to improving the quality of your software and the customer experience. This is the point where your software begins getting better each week, and your customers begin to enjoy a continuously improving experience. • Development and test cycles: Prevent issues from happening by identifying problems before they reach production. • Launch readiness: Use load testing and simulated user testing to better understand performance and identify resource requirements accurately. If creating great customer experiences really is a team sport, then it makes sense that everyone on the team needs access to the data and analysis required to do their particular jobs. Everyone with a stake in your company’s digital experience needs to be able to easily see the relevant data and analyses, and be able to query that directly to answer the questions that matter to them. As noted in Chapter 2, that group can include everyone from software developers to operations, from customer service to product management, from sales and marketing to top execs. Be prepared for surprises as the data becomes more widely available. You’re turning on the lights to see more clearly the truth about the customer experience you deliver. Enjoy the “aha” moments as people across the company begin to connect the dots and discover exactly how your software is running and how customers are using it. How do you share data across your company? With so many different stakeholders involved with your customer experience, how do you keep everyone on the same page? The business moves quickly, so you need real-time data to stay up to date with the latest launch or buying season—spreadsheets are already obsolete by the time they get posted. But you also need historical data so that you can track how things are moving up or down. And as the business evolves, the KPIs evolve with it as new opportunities and challenges are identified—you need a way to easily change and customize the metrics the team is looking at. Figure 1: A sample shared dashboard for digital business teams. 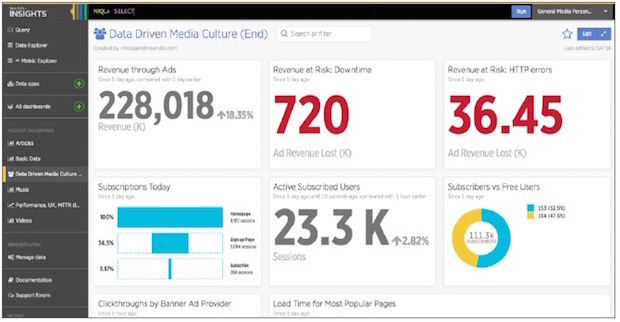 Figure 2: A sample shared dashboard for content and media teams. 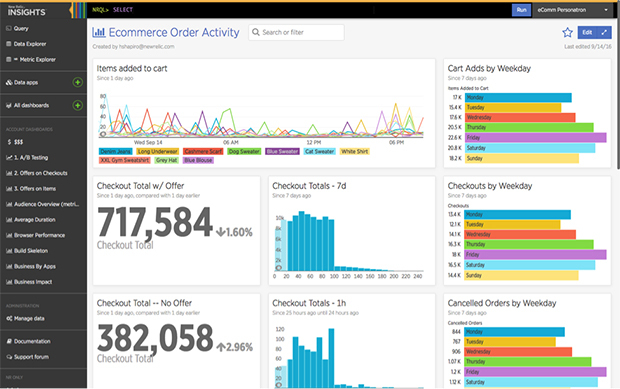 Figure 3: A sample shared dashboard for e-commerce and retail teams. What do you need to successfully implement this four-step methodology for improving digital customer experience? First, it takes a digital intelligence solution that delivers 360-degree, end-to-end visibility into the performance of your websites and apps, the customer experiences they deliver, and their effect on your business. Second, because delivering a great digital customer experience is a team sport, your digital intelligence solution must provide that data to everyone who needs it, when they need it, in the ways they need it. 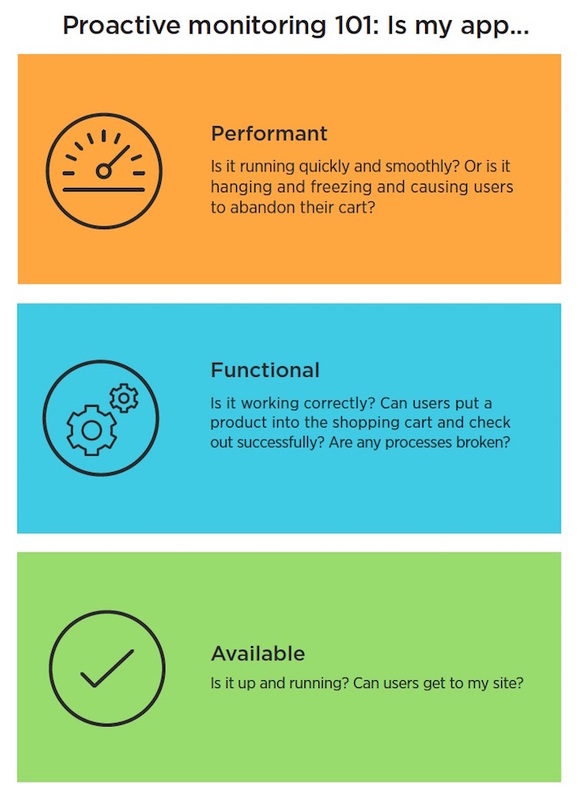 Let’s take a closer look at what’s involved in every step, and how the various elements of the New Relic platform can help. Digital intelligence is a relatively new category of technology insights. In a nutshell, it’s about gathering data (billions of data points, actually) from your live production software and using it to change and improve the way your applications and business run. While it includes Application Performance Management (APM), digital intelligence is more than that; it’s full visibility into performance, customer experience, and business metrics. APM forms the basis for your digital customer experience improvements by providing detailed, real-time performance metrics for your applications. With an APM solution such as New Relic APM you can view application performance down to specific lines of code, see how each service is connected, and get the info you need to resolve problems fast (Fig. 4). And with New Relic Infrastructure, you can even tie this application performance data together with context about your dynamic infrastructure and containers for complete visibility across your entire stack. But while your server-side application is a key lever influencing customer experience, it alone doesn’t cover everything you need to know. 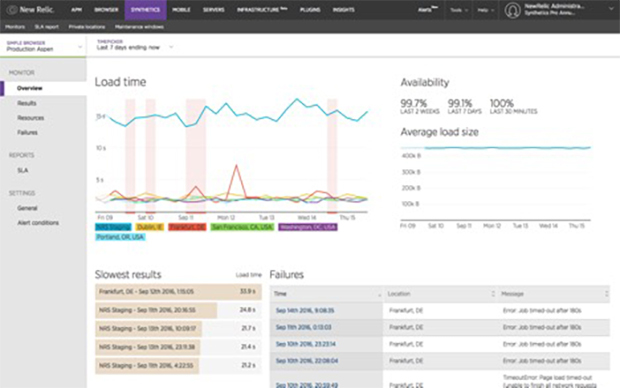 Figure 4: New Relic APM gives you visibility into how your application is performing. Whether you use AngularJS, React, Ember, Backbone.js, or a custom app framework for your single-page app, New Relic Browser is designed to give you visibility into the impact of frontend performance on the customer experience (Fig. 5). And because New Relic is framework agnostic, you’ll have visibility into your software no matter how framework technologies change. Figure 5: New Relic Browser helps you understand the real customer experience for your website. Client-side code running in the user’s web browser has been estimated to be responsible for 90% of user wait load time. But there is often little visibility into the user’s experience in the browser, especially with the increased complexity of different frameworks for single-page apps. New Relic Browser is built to provide full code visibility for web applications at every point in the delivery chain, with deep integration that helps frontend and backend developers collaborate more effectively. With New Relic Browser, you can see the reality of the user experience and know exactly what’s happening with actual real user data, from how long a page takes to load to understanding which errors occurred. You gain actionable information that lets you create faster, more engaging digital customer experiences. Releasing a mobile app can be a leap of faith. The need for frequent code releases and the dramatic impact of user ratings on downloads can put extreme pressure on mobile teams. Yet once an app hits the real world, developers often lose visibility into its performance. Does it crash? Why does it crash? How are users interacting with it? What is its resource consumption? Figure 6: New Relic Mobile lets you see what’s happening with your native mobile apps. 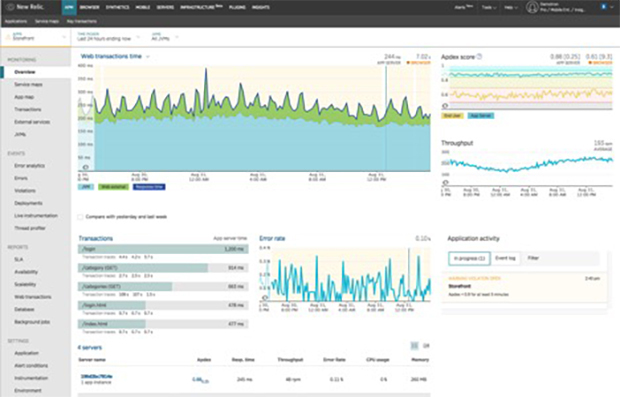 Designed to provide code-level visibility into mobile app behavior, New Relic Mobile supplies the performance data you need to make sure customers are having a great experience, including performance data about networks and third-party services, crash diagnostics such as stack traces and frequency trends, insight into HTTP errors, and much more (Fig. 6). You can even track and analyze deployment trends to make sure your app improves with each release. But that’s not all—mobile app teams also need visibility into the full technology stack, from the native app to the backend systems and beyond to third-party services. The New Relic platform provides a holistic solution for mobile developers, backend developers, and operations to monitor, manage, and improve the end-to-end performance of mobile applications. The increasing importance of the digital customer experience to the success of the business puts software and IT teams under rising pressure to maintain specific service levels for customer-facing applications. But as software gets more complex, it becomes more difficult to make sure that critical application flows are available to customers at all times. Relying on tracking only issues experienced by real users may not reveal problems soon enough. Ideally, you want to know about any issues before they actually affect your customers. New Relic Synthetics is designed to be an easy-to-use way to make sure your website is up and your critical services and customer-facing transactions are available and working properly across different geographies and platforms (Fig. 7). Proactive monitoring with New Relic Synthetics simulates user behavior to help you validate availability, functionality, and performance for continuous, last-mile monitoring of your application. Fig. 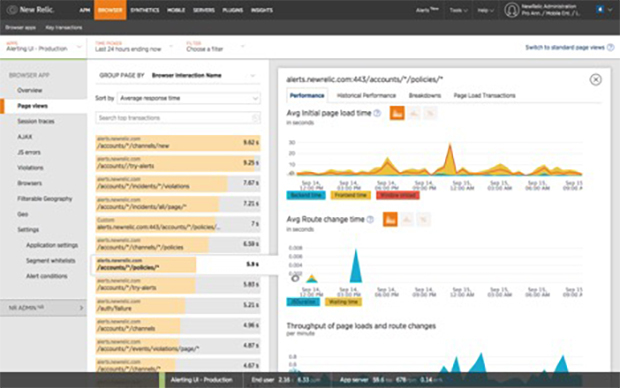 7: New Relic Synthetics lets you proactively find issues with your websites and mobile backend services. One key to building and maintaining great digital customer experiences is making the relevant data easily accessible to everyone in the company who needs it. Creating and disseminating a single source of truth helps all stakeholders—developers and operations engineers, sales and marketing, product management, customer service, and executives—collaborate more effectively and act quickly and uniformly. 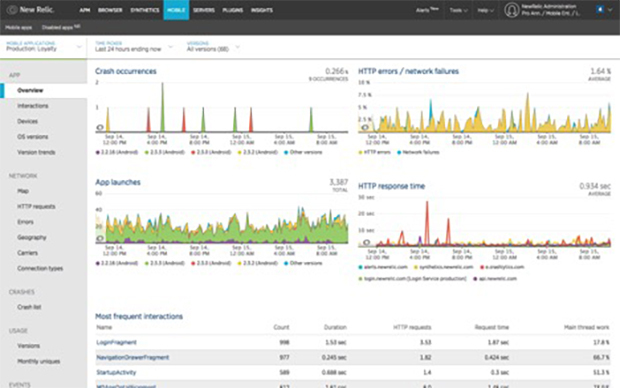 Figure 8: New Relic Insights dashboards let you analyze and share data across your teams. 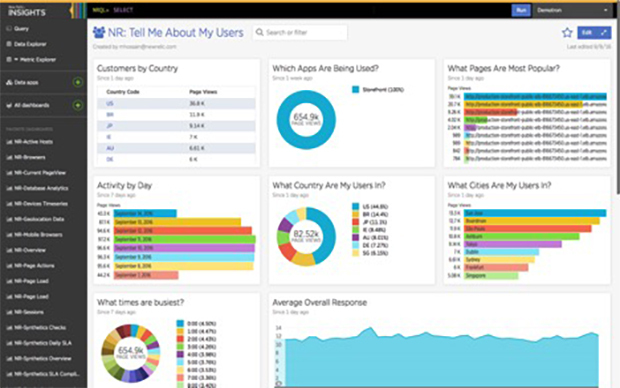 All the products in the New Relic platform share a powerful and easy-to-use analytics platform: New Relic Insights, which is designed to provide a single pane of glass to view and analyze data sent to New Relic from across the entire application stack (Fig. 8). 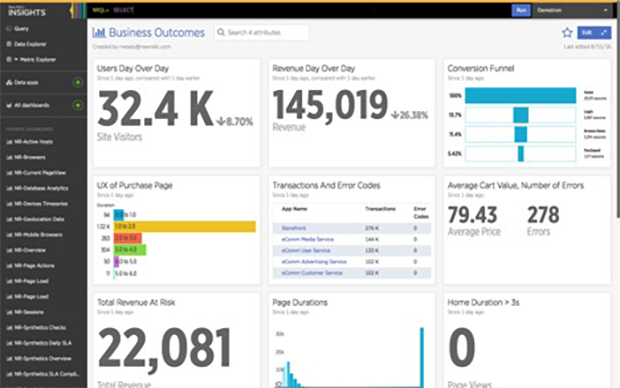 New Relic Insights makes it fast and easy to build a wide variety of dashboards to help stakeholders better understand what customers are experiencing. Just as important, Insights enables almost anyone to create queries that answer key questions about application performance and customer experience—all in real time. Think of New Relic Insights as a common playbook for the entire team. Finally, underlying your digital experiences is your IT infrastructure, across on-premise, hybrid, cloud, and container environments. These services support all the other layers of your technology stack, and issues here can bring down everything above. Critically, as these environments become more dynamic and complex, keeping track of infrastructure (in relation to the health of the rest of the stack) has become even more important. New Relic Infrastructure provides real-time infrastructure health metrics correlated to change events so you can identify and fix problems faster, while inventory-wide visibility can help surface configuration vulnerabilities in seconds instead of days or weeks (Fig. 9). These advanced features help you improve ops efficiencies and reduce your company’s risk exposure. 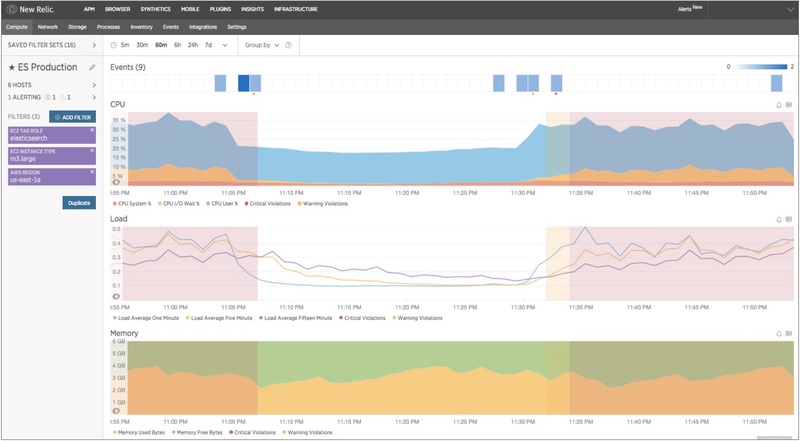 With native support of a slew of AWS services, as well as deep container and microservice data collection, New Relic Infrastructure is designed to make sure the DevOps teams delivering your company’s digital experiences have the visibility they need to make sure that everything is running smoothly. Figure 9: New Relic Infrastructure can monitor health metrics against configuration changes in dynamic environments. Improve customer satisfaction and loyalty, help retain more customers, and generate more incremental revenue from high-value customers. Make better software and resource decisions, focusing efforts on the areas that promise the biggest return. Foster collaboration across the team and across the organization as everyone has access to the data they need to contribute to the success of the software—and the business. Drive great business outcomes (more conversions, more customers, more brand awareness, better competitive advantage) by better understanding and improving the customer experience. Put simply, the New Relic platform gives you end-to-end visibility through all the different layers of your technology stack, helping you see more clearly into the digital experience your websites and mobile apps are providing to your customers. This visibility helps you fix problems before your customers even find them, and uncovers deep user insights that can then be shared across your organization, connecting IT teams to their impact on your customers. Let’s check back in on Olivia. 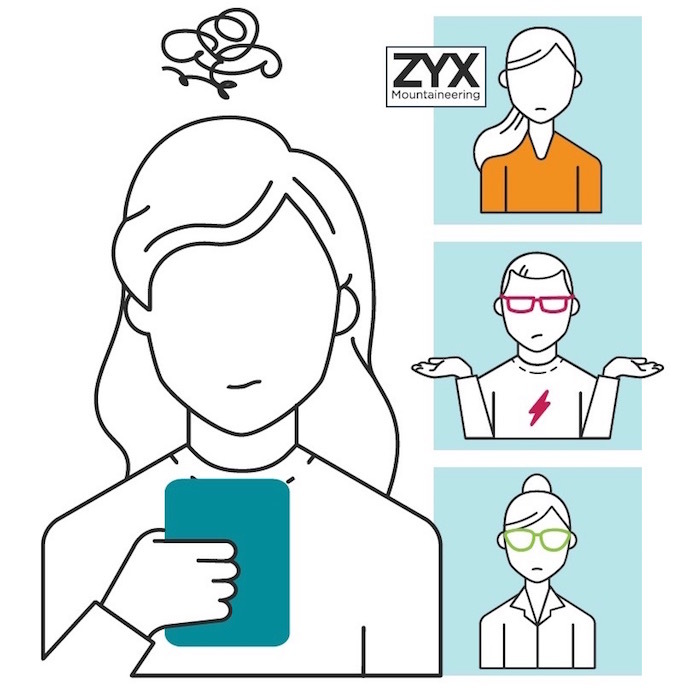 Your team at ZYX Mountaineering followed the four-step methodology and was able to find and fix the issues that were negatively affecting her customer experience. Today, you’re proactively monitoring and optimizing your websites and apps to create the best possible digital customer experience and discover and quickly resolve any issues that crop up. So when Olivia returns to your website to shop for more climbing gear, everything loads fast and error-free. She’s able to find and use the site’s new features to make the shopping and purchasing processes easy. Several days later, when she uses your mobile app to post a review about the gear she bought, she finds it equally convenient and pleasant to use. She posts a five-star rating. Improving your customer experience not only helped you gain a new customer, you’ve created a brand advocate. Congratulations!